Facebook Messenger for BlackBerry released | BlackBerry Blast! 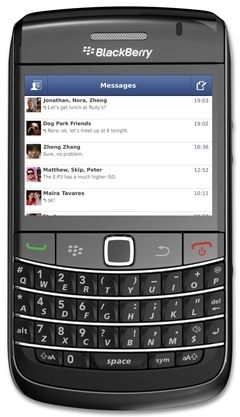 Facebook has released the Facebook Messenger app for BlackBerry. Previously the app was available on Android and iOS and now BlackBerry users can make use of the app too. From the Facebook Blog: "We're excited to announce an update to Facebook Messenger. In this version, we've included a bunch of new features and performance improvements designed to make your messaging experience even better. Now you can see who's online and who's on mobile, and know when the other person is typing. It's also easier to send messages to the people you message most. With this update, the app is now available for BlackBerry in addition to iPhone (including iOS 5) and Android. We've also added support for 22 new languages for Android, and 12 new languages for iPhone."